Unlike typical cross-section analysis, which imposes a static nature to your models, a pooled cross section allows you to incorporate a dynamic time element. You can do this with a pooled cross section because cross-sectional units are observed in two or more periods. Typically, pooled cross sections contain many more cross-sectional observations than the number of time periods being pooled. Consequently, the models usually resemble cross-sectional analysis with possible heteroskedasticity corrections. Because the time gap between the collection of cross-sectional units is usually large (anywhere from one year to several years apart), autocorrelation and other time-series issues tend to be ignored. It’s not uncommon to confuse a pooled cross section with a panel dataset. Both contain cross-sectional measurements in multiple periods, but in a panel dataset the same cross-sectional units are included in each time period rather than being randomly selected in each period. With pooled cross-sectional data, the population distribution from which the random samples are drawn may change over time. If you use a pooled cross section, you’ll want to examine potential time effects. 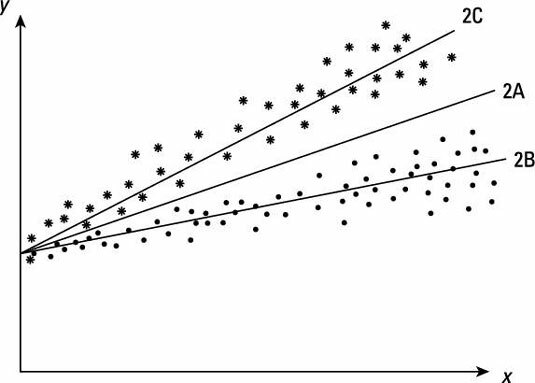 If you ignore these time effects, you may obtain biased estimates of your regression coefficients. One possibility is that a changing population distribution results in different intercepts and/or slopes over time. The figure illustrates how accounting for a changing intercept may be important with pooled cross-sectional data. If you don’t account for time effects, you obtain the sample regression line 1A (with a biased estimate of the intercept). However, accounting for time allows you to identify lines 1B and 1C. Time can also influence the impact of your independent variable on the dependent variable by altering the magnitude of the slope. If you ignore time effects, you’ll end up with line 2A. 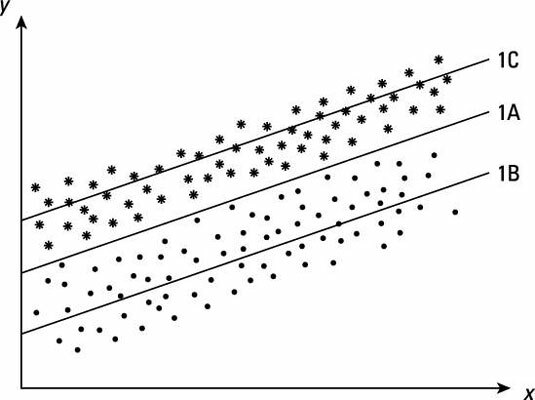 Regression line 2A has heteroskedasticity, and, more importantly, a biased estimate of the slope (impact of the independent variable). By accounting for time effects, you can identify lines 2B and 2C, which appropriately estimate the slope.